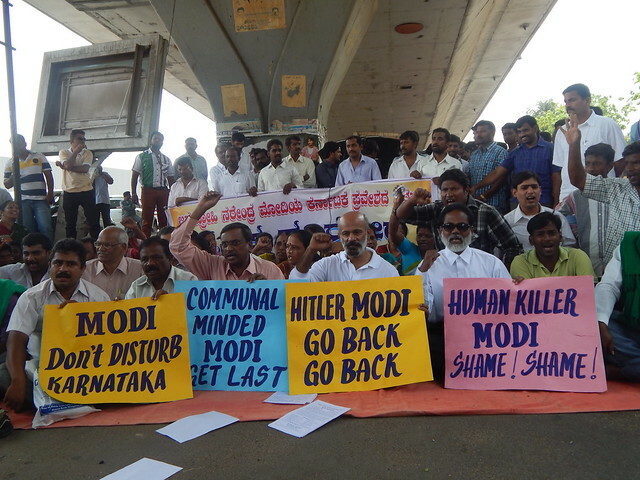 Bengaluru: A section of civil rights activists and concerned citizens gathered in the state capital, under the coalition banner of Karnataka Komu Souharda Vedike (KKSV), to protest against Narendra Modi’s visit to the state. “Modi go back” resonated in the air as protesters kept shouting the slogans. Writer and critic Agni Shridhar who was part of the protest said, “Modi, like any other citizen of this country has a constitutional right to enter any state, and this protest is not against his right to enter. This protest is against the butcher and mass murderer of people belonging to the minority community; it is against his crimes. The people of Karnataka do not want such a person to enter our state, we would not agree to it morally”. Freedom fighter H.S. Doreswamy, Senior journalists Indudhar Honnapur, KKSV President KL Ashok and Human rights activist and advocate T Narasimha Murthy were among the noted participants. Modi is all set to campaign in Bangalore this evening, which BJP party workers believe would turn the tables in their favour in this election. Nicely written bhai! Keep doing the good work of exposing communal pigs. Modi is now a “Mask” of all communal and fanatical persons living in our backyards ,streets and settlements.BJP has given a chance to all their sleeper cells to get active due to Congress failure to end Corruption and do justice to the Nation.If the people of India developed such instincts against their own people giving them the minority tag,Modi,the Monster of the World capture power and is going to give full strength and we can see a big polarized India wherein the GUJARATI MODEL VENOM WILL KILL INDIA,THAT IS WHAT BJP/RSS WANTS.